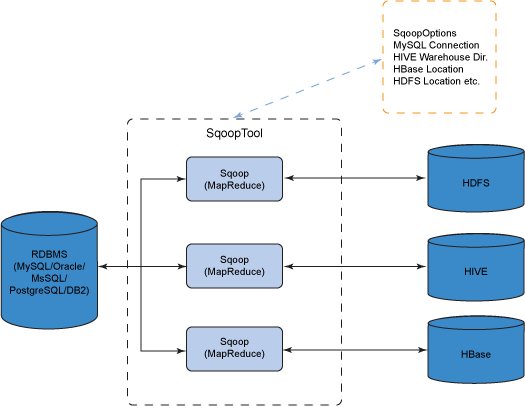 It supports incremental loads of a single table or a free form SQL query as well as saved jobs which can be run multiple times to import updates made to a database since the last import.Using Sqoop, Data can be moved into HDFS/hive/hbase from MySQL/ PostgreSQL/Oracle/SQL Server/DB2 and vise versa. Step 1: Sqoop send the request to Relational DB to send the return the metadata informationabout the table(Metadata here is the data about the table in relational DB). Step 2: From the received information it will generate the java classes (Reason why you shouldhave Java configured before get it working-Sqoop internally uses JDBC API to generate data). Step 3: Now Sqoop (As its written in java ?tries to package the compiled classes to beable togenerate table structure) , post compiling creates jar file(Java packaging standard).